Super Hero Boy: Have you ever had to actually count the times your baby kicks? Have you ever had to actually count the times your baby kicks? I'm not sure about you guys, but I actually cackled when my ob/gyn asked me to count the times my baby kicked during the day. I howled and then laughed so hysterically I pretty much peed my pants. (I only wish I was kidding on that one...) Connor was VERY active when he was still a podling and trying to count his kicks was more like trying to count the raindrops in the yard. He was either awake and kicking or asleep.. just on and off.. pretty much the same as he is still to this day. Its possible I would have been far less overwhelmed by that task if I would have had a Kicktrak back when I needed it! The Kicktrak allows you to keep an electronic record of your babies movements starting as early as 24 weeks. You just use it once a day at your child's most active hour (for Connor that would have been around midnight) and the Kicktrak keeps a record of your last ten sessions so you can see right then and there exactly how the little one is progressing or if there is possibly a problem. Unlike having to write down each little roll, jab, or kick you just press the button anytime you feel a movement. The Kicktrak not only keeps track of how many movements are completed it tells you when the recommended 10 movements an hour have happened. Connor would have completed his 10 movements in about five minutes though most babies take about 30 minutes. So instead of walking around with a notebook, or in my case whatever I could find including napkins, you can just walk around with the Kicktrack around your neck or close by and keep doing what you need to do without having to constantly try to find your pen and paper. If you want you can just take your Kicktrak with you to the Ob/Gyn instead of lugging around those forms, that I always lost. You can review your progress with him quite easily and the Kicktrak will travel with you very easily in a purse or diaper bag. As a bonus feature the Kicktrak even displays how many weeks and days you have left in your pregnancy, which most mom's will agree towards the end is magical as though I loved being pregnant myself, the last two months were rough and I think towards the last few weeks I even counted the hours. Am I crazy to be just as excited to do it again one day?? I think I must be crazy. 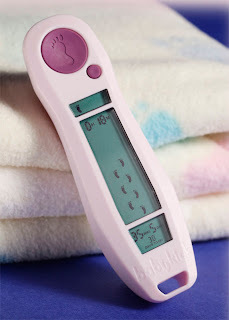 Hey, when its time you can even use your Kicktrak to time your contractions. If you have never been there, believe me it gets chaotic and instead of assuming your wonderful other half can count under the pressure just use the Kicktrak ! The Kicktrak is available directly from their website or on Amazon! What a cool product! I would love to have this!! Great review Thanks!